Well, that was over the top. 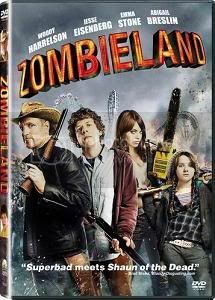 Zombieland is the perfect movie to take the recent spate of Zombie movies and TV shows and turn them on their ears. 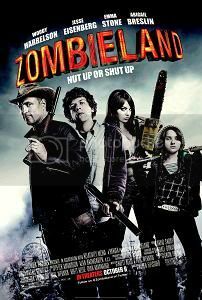 Sure, some of this has been done before (the humor in Shaun of the Dead), but Zombieland takes everything so far over the top that you can't help but laugh (at times), or just wince - and then laugh (somewhat uncomfortably). There is a ton of blood and gore in Zombieland, but most of it is done so comedically that it isn't terribly disturbing. OK, it's a little disturbing, but the way it's all done is so cartoonish that it hits the right tone for the movie. Director Ruben Fleischer made this move with a lot of flair and dramatic visuals - often gruesome, gory visuals, but visuals with style and flair all the same! The movie's balance between clever, hip humor and the serious nature of trying to survive a world infested with zombies gives it the right tone to pull off this kind of thing. Over the top violence and gore combined with wit and humor is what makes the movie somewhat accessible to people who would otherwise avoid a gory film like the plague. It's not without flaws, and sometimes the over the top nature of the gore just gets to be a little too much. The opening montage certainly pushes up close to that line (or past it, depending on your point of view), and there are other moments in the movie that go a little too far over the top, but the survival tips given by Jesse Eisenberg's Columbus are both hilarious and (if the world really were infested with flesh eating zombies) helpful. They make sense, but are presented in a very clever manner that shows off the film's wit well. The cast is fairly good, led by Eisenberg and Woody Harrelson, but also ably joined by Emma Stone and Abigail Breslin. They carry off the outlandish concept of the movie well enough to allow the viewer to completely buy in to not only the concept, but the over the top nature of what's going on at any given time. There is nothing to complain about in regards to the quality of the picture or sound on the DVD, which is to be expected from a movie that came out in 2009. It looks and sounds good, but not great - but it's not supposed to look like Avatar or Pirates of the Caribbean. It's a little grainier (slightly) and the colors are a little muted (intentionally) - except for the blood, of course. All in all an entertaining movie... If you can handle the blood and gore.